Jonathan Rhys-Lewis commented at the Community Archives Conference ’formal training days for volunteers in areas like cleaning would be beneficial’. Thirty years ago there was an urge to preserve our heritage that resulted in independent museums across the country. The past years have seen the same urge manifesting in community archives. Both movements had something counter-cultural about them so that the orthodox museum world and then official archives were seen somewhat as the enemy. Whilst the stand-alone attitude has achieved some remarkable results, it is perhaps time to build some bridges and work together. County Record Offices have the expertise to show us how to care for our collections. They also have the brief to educate their communities on archival preservation. Here in Norfolk, an excellent working relationship between the County Record Office and groups such as community archivists has been established. 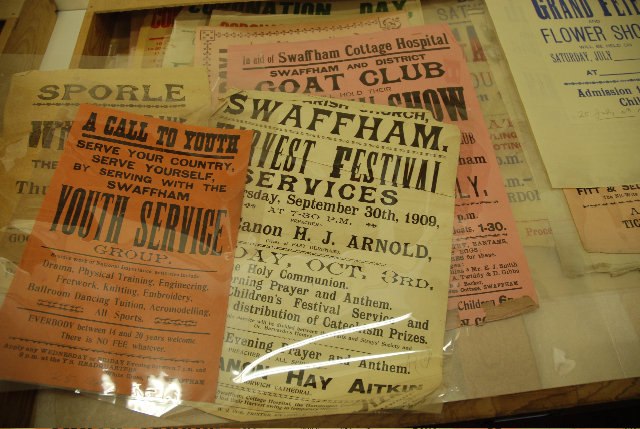 For the past nine months, Swaffham Community Archive Group has been meeting at Swaffham Museum developing its own website and working on the documents and photographs in the museum collections. Having explained our project to the archive conservators, in September we were offered a half day training course in their studio at Norfolk County Record Office. We were encouraged to recognise items at risk, shown correct handling techniques, taught how to carry out basic cleaning and storage, and given some great tips on how to do this safely but cheaply. Make-up brushes from Boots are far cheaper than anything sold in a conservation catalogue! Because of their input we have been able to set aside documents too fragile for anyone to examine at the moment. We shall be looking for funds so they can be worked on by a paper conservator in the future, but for now they are safe. We have secured a grant to purchase basic storage supplies such as polyester sleeves and acid free envelopes and to order in some bespoke sleeves for one outstanding collection. We also benefited from the skills of the sound archivist who transferred audio recordings in outdated formats to digital files that we can upload to our website and make available for museum visitors on a terminal in one of the galleries. Cleaning and caring for paper-based items has made them ready for digitisation, but it has also opened new ways of bringing our archives alive. We had a working party of record-office-trained volunteers to clean a collection of posters and to place them in polyester sleeves. The posters are now available for the public to inspect ‘in the flesh’ not just as digital images. They are also available for display and each month a different group from the community – the Guides, museum governors, design students for example selects ten posters to be displayed in the Staircase Gallery at Swaffham Town Hall. Conservation has created access. Archives collected by the community have gone back into that community for fresh critical assessment as well as enjoyment. A myth has grown up in the world of community archives that Record Offices and County Archives are out to get any papers of any interest for their own collections. Our experience has been of conservation experts available at the end of an email, ready and willing to share their knowledge and support community archivists in their task. I would urge other groups to act on Jonathan’s recommendation by first approaching their County Record Offices.